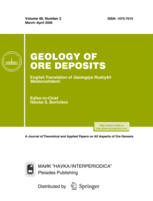 Geology of Ore Deposits (Geologiya rudnykh mestorozhdenii) is one of the few special periodicals devoted to metallic and nonmetallic mineral resources and the conditions of their formation and distribution. Founded in 1959, it offers original scientific articles and reviews on a wide range of problems in theoretical and applied science. The coverage focuses on such problems as deep structure of the Earth, geodynamic processes and ore formation; distribution pattern of metallogenic zones and mineral deposits; geology and localization conditions of large and unique metallic and nonmetallic deposits; mineralogy of metallic and nonmetallic deposits; physicochemical parameters, isotopic characteristics, and geochemical environment of ore deposition; evolution of ore-forming systems; radiogeology and radiogeoecology, economic problems of ore districts and deposits development.